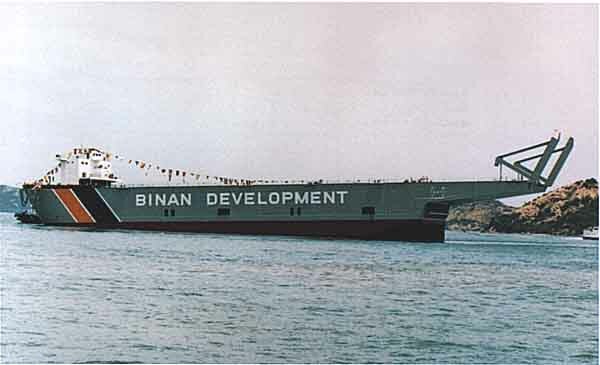 Mitsui Engineering & Shipbuilding Co., Ltd. (MES) has delivered a non-self-propelled sinking barge TENYU to Binan Development Co., Ltd. with its head office in Tamano City, Okayama Prefecture. With its fork-on/fork-off, roll- on/roll-off, and float-on/float-off systems, the barge is claimed to be suitable to carry on its upper deck and/or superstructure deck large-size cargo such as container cranes, offshore structures and ships. The barge's stern is equipped with a fork. The fork sponsons and outriggers* attached to their tip allow cargoes such as container cranes to be loaded or unloaded by means of ballast adjustment. In addition, the adoption of the fork-on/fork-off method eliminates the need for a ramp way, quay reinforcement, or temporary railing. Special design considerations were given to remarkably reducing acceleration on the cargo generated as a result of the barge's rocking during travel - much less acceleration than with conventional barges. This feature makes the barge extremely suitable for carrying cargo of delicate structures, such as container cranes, tower cranes, and plant modules. Furthermore, substantial cost reduction has become a reality as reinforcement and lashing** usually required for transport of such cargo have been much alleviated. * Outriggers : Used as an extension of a cargo-handling fork when length of the fork is insufficient. ** Lashing : Fastening cargo to the hull, using binding and/or clamping implements.